Happy Hump Day! I'm co-hosting the WOW Linkup as usual today and sharing a call for guest posts which you should check out. 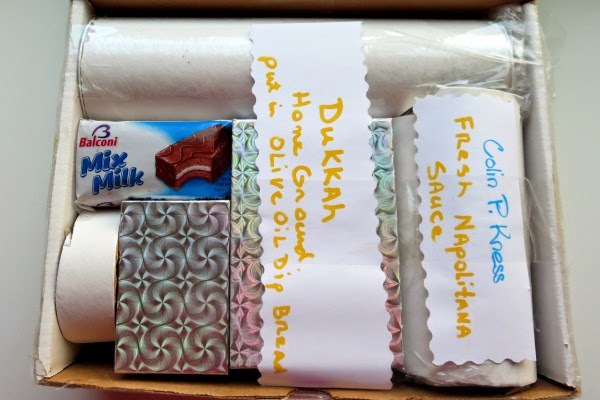 Today's also Foodie Pen Pals reveal day, and I'm excited to share the awesome Foodie Pen Pals package I got this month. This was my third time participating in the program after a two month moving-and-trip-to-India-induced hiatus. This time I was paired with Colin, who doesn't have a blog but is still an awesome foodie. I mean, just look at that packaging job! Especially love the labels and the use of cardboard tubes to keep everything in place. Genius! -Peeps: These were a big hit with my housemates. -Trader Joe's Corn Salsa: This is one of my favorite salsas to throw in salads. So good! -Trader Joe's Fancy Olives: I don't eat olives enough. I'm excited to use them to liven up my salads. -Cool European chocolates: Umm, it's chocolate. Enough said. -Spicy Cashew nuts: Love cashews and spice. How did he know? -Homemade Dukkah: Wikipedia tells me this is "an Egyptian side dish consisting of a mixture of herbs, nuts, usually hazelnut, and spices" and is also spelled duqqa. Haven't tried it yet but it smells amazing! Thanks so much for the great package, Colin! 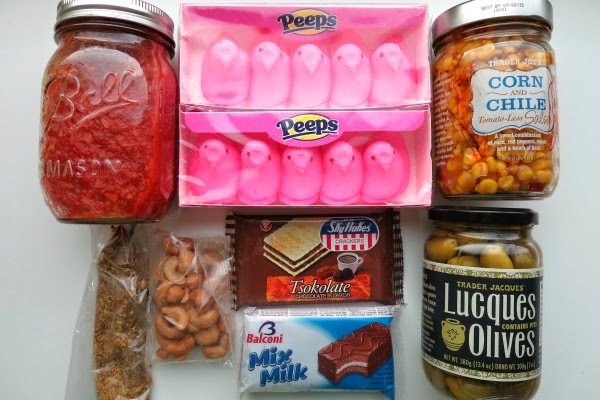 I'm a huge fan of the Foodie Pen Pal experience and highly recommend it to anyone who's considering signing up for the next exchange. I'm super bummed I won't be able to join in May because I'm gone the whole month. If you'd like to join so I can live vicariously though you, click here to learn more and sign up by May 4th. I love seeing the surprises that people get in the mail. Enjoy all your goodies! Thanks! I love foodie pen pals!